Preheat oven to 350 ° degrees F.
Melt butter in a heavy skillet over medium heat. Sauté onion until soft and translucent. Combine ground pork, chopped bacon (or pancetta) in a mixing bowl until blended. Incorporate the sautéed onion, garlic, allspice, sea salt, thyme and ground pepper into pork mixture. Then add eggs, cream and cooled Cognac. Mix well. Take bacon slices and place them across the short side of the pan, letting the bacon overlap the sides of the pan. Press the pork mixture into the loaf pan and on top of the bacon slices. Fold the bacon slices (that were hanging over the short sides of the loaf pan) back across the top of the pork mixture, completely covering the pate. Tightly cover the loaf pan with foil. Place loaf pan into a larger baking pan and pour boiling water into the larger baking pan to come up halfway up the outside of the loaf pan. This liquid bain-marie will help to poach the pâté without burning the edges. After about 2 hours, insert an instant-read thermometer into the center of the foil and remove from the oven when the internal temperature reaches 155 – 160 ° degrees F.
Remove the loaf pan from the baking pan. Cut a piece of heavy cardboard to fit onto the foil and place a few heavy cans on top of the cardboard to weigh down the pate. Place in the refrigerator overnight. 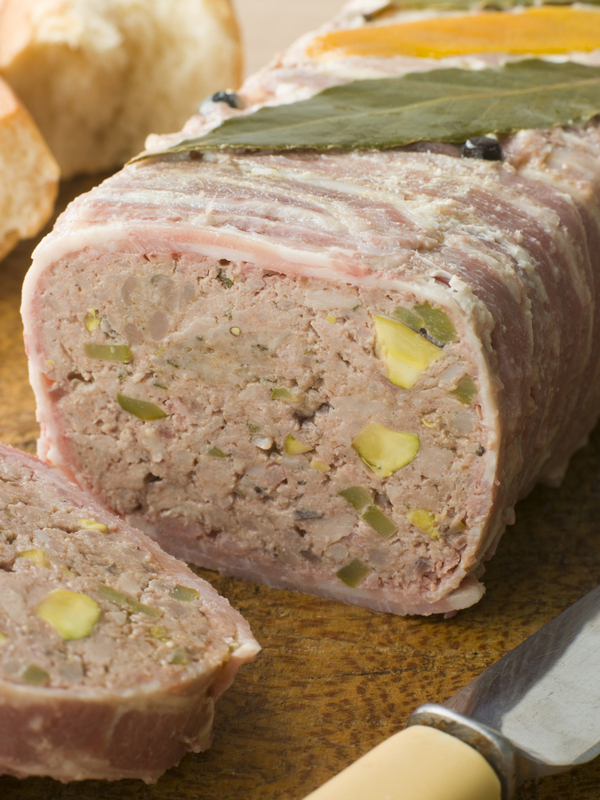 The pâté can be made ahead and will store nicely in the refrigerator for several days. When ready to serve, place loaf pan in a larger pan of hot water for a couple of minutes to loosen the fat. Invert the pâté onto a serving board and garnish with Cornichons, sliced baguettes, and Dijon mustard. Slice pâté crosswise into ½ inch slices for serving.